Our wide range of cable labels, panel labels, jack labels and outlet labels all Made in the USA and ready to be printed using your PC, Tablet or direct from your smartphone to any standard office laser printer. We control the manufacture of all our cable labels and our technicians use them every day on a real installation of structured cabling projects. 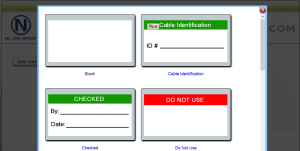 You can be assured that our Labels for Patch Cables along with our Labeling of Network Cables means that using our Cable Labeling System with our Cable Label Software will give you the best results. 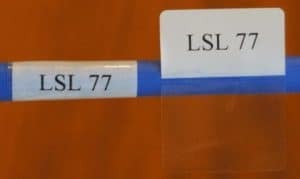 Many companies sell Network Cable Labeling System, but we make and use our own Data Jack Label and panel labels for our cable labeling project every day, which gives you the Best cable labels, quality, and cost every day. 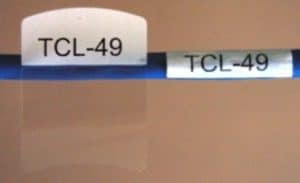 Our self-laminating wrap-around cable labels are thinner, more flexible and have upgraded adhesive for superb performance and greater adhesion in both normal and harsher environments for your wire labeling. Designed for printing on a Laser printer, the top third of the wire markers being the print area, and the bottom two-thirds of our wire markers are clear polyester which over-laminates the printed part once applied. We have many sizes in our range that cover all structured cabling to most low voltage applications and electrical installation. We have 14 sizes and will be adding more very soon as we develop our product line. Quality drove wrap around wire markers designed by technicians for use by technicians around the world. To understand every technician’s requirement and offer one on one support. Made for most wire labeling and Cat6, cat 5, patch cord labels, network labeling, these new labels as the best cable labels. This is a new design that helps the Technician install the labels in hard locations and the curse edge help the start of the labels in the cabinets and small places that the Techs work. Our new design helps the guys who have to install all these labels and although it’s just a small upgrade having installed thousands of cable labels over the years these small changes save time and money. Standard Patch Panel solutions will fit most commonly installed patch panels, our adhesive products are made from white polyester and can be printed on any office laser printer. All made in the USA our patch panel solutions can be printed with our templates. We have some new Patch Panel labels made for 6 port patch panels to fit most manufacturers and Cat6 panels and cat5 structured cabling systems and RoHS Compliant. Adhesive outlet labels will fit most data jacks and receptacles used around the world they are made in the USA from white polyester on plain sheets for printing on any office laser printer. Our data jack products are made from the best materials for use in data communications, audio and electrical receptacles of many sizes and template to choose from. We have a new range of data jack outlets labels that will fit the most common sized wall plates. Our new laser engraving labels for the data network cabling, IT, telecommunications, electrical and engineering industries, we use state of the art laser engraving machines which means we can produce labels quickly and cost efficiently. Our teams are experts in patch panel engraved labels and have many years of experience working with the top data communications manufacturers. Our patch panel engraved labels can be made and shipped to the site in no time, we can turn around in a couple of days. Design and print your labels online for perfect results, our state of the art web-based printing can be used any place from any device, no need to download or spend money on software which is always out of date. Our web-based service is growing every month and allows you to print our labels for free, no more download and PC’s just click and print. We are adding more features each month and our web-based software is always up to date and no waiting for any updates. Our products are made in the USA to support the structured cabling installations for all Network labeling, the quality is better and costs less than any competitors, our printable laser sheets are the best-made quality. Over the years we have worked out the best solutions and labeling software that help you with all marking, wire marking linking this with our new labeling software make any cat6 patch cord stand out. Structured cabling with the best wire marking help and saves money in the long run, any Cat6 structured cabling wire markers that are not used or installed will cause problems later, our wire labeling and structured cabling teams know that the best in the market come from Network Connections Group USA. We will provide you with the most cost-effective labeling products. Our FREE web-based software and templates give you the printing tools for FREE to printing your laser sheets. Same day standard fixed price shipping from the USA and UK with FREE samples and tech support. We give the best support for any wire labeling project from a few wire labels to a full structured cabling installation. Tested by Cabling technicians and printed with our FREE web-based software www.printmycablelabels.com we are labeling experts and only use the product our own Tech’s use every week.